Recreate your own hilarious THE LEGO® MOVIE 2 scenes with LEGO Minifigures 71023 THE LEGO MOVIE 2 collection. This new-for-February-2019 lineup of exclusive, Limited Edition characters comes with an array of exciting accessories and cool costumes. 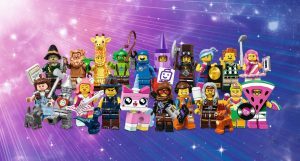 Enjoy all-new THE LEGO MOVIE 2 adventures with Awesome Remix Emmet, Battle-Ready Lucy, Apocalypse Benny, Giraffe Guy, Crayon Girl, Sherry Scratchen-Post & Scarfield, Hula Lula, Watermelon Dude, Flashback Lucy, The Swamp Creature, Candy Rapper, Gone Golfin’ President Business, Apocalypseburg Abe, Vest Friend Rex, Kitty Pop, Dorothy Gale & Toto, Cowardly Lion, Scarecrow, Tin Man and a Unikitty figure! 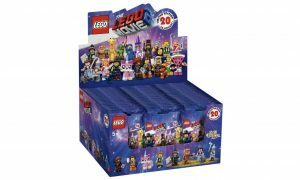 Each collectible minifigure comes in a sealed ‘mystery’ bag together with one or more accessory elements, plus a collector’s leaflet and a unique display baseplate. With our Best Price guarantee and Express Shipping Worldwide, it’s a no brainer on who to get your new LEGO Movie 2 Minifigure Boxes from! , Minifigure Maddness of course! . ← Lego Minifigures Harry Potter Series boxes, back in stock now! .